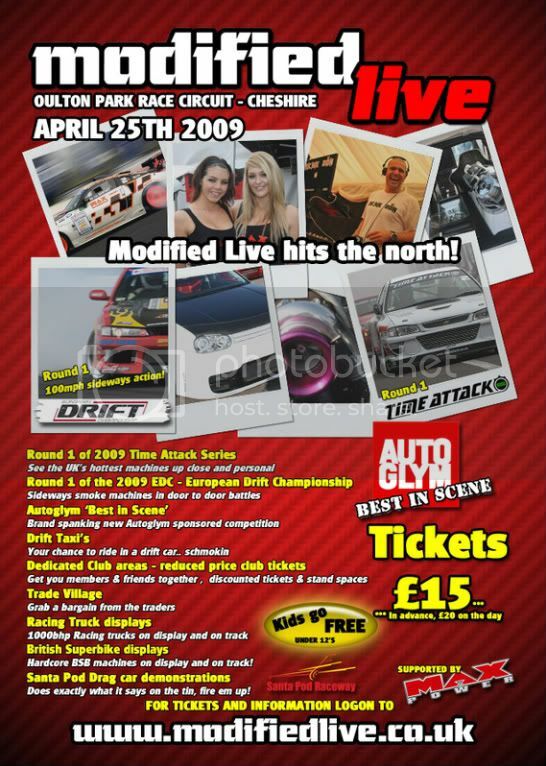 After the great success of Modified Live last year at Snetterton , we've made 09' a two part deal, the first at Oulton on 25 April and the last at Snetterton in 11 October. DUB - Big rims, Big Bling, USA based styling and ICE. EURO - Euro Style all the way, smooth bodywork, subtle styling, small rims, stretched rubber. JDM - Pure JDM heaven, Tokyo style. OEM - How clean is clean, factory standard OEM, straight out the showroom type cars. RETRO / CLASSIC - Pre 93 Retro rides, Old skool, Retro Ford or even a classic. UK HERE & NOW - Representing what’s hot and happening in the UK right now, full on hot body styling, ear popping ICE, trick paint, this is you. UK FUTURE - Trend setting mould breaking future visions. LOWRIDERS - Low riding Yank tanks rolling double low to the black stuff with a bounce. For details on how to enter please contact pippa@modifiedlive.co.uk. For more info on the show check out Modified Live - The ultimate modified car shows.